Despite being a former world champion, Amir Khan appears to be heading into his upcoming title shot against WBO welterweight champion Terence Crawford as a heavy underdog. 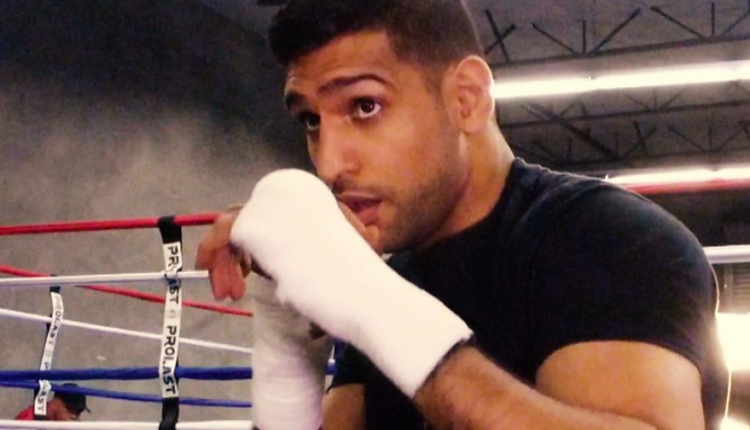 Khan chose to take a guaranteed million-dollar payday to face Crawford in the U.S. rather than take a long-awaited matchup with British rival Kell Brook. Crawford-Khan was officially announced just a couple of days ago, and the fight is expected to take place at either New York’s Madison Square Garden or Las Vegas’ MGM Grand. This will be Khan’s first shot at a world title in about three years. His last one did not go well, as he was knocked out by Canelo Alvarez when challenging the Mexican fighter for the WBC Middleweight Title. That ultimately was Khan’s last boxing match for two years, too. All this in mind, many consider Khan to have the odds stacked against him against Crawford, who many experts feel is one of, if not the, best pound-for-pound boxer in the world. But Khan pays no mind to oddsmakers and even went as far as to say the silver medal he won at the 2004 Olympics would be a bigger accomplishment even if he were to beat Crawford. “I know a lot of people are saying I’ve got no chance against someone as good as Terence but I firmly believe I will be the first man to beat him and take his place in the pound-for-pound rankings,” Khan said. “I’m not going to America as the opponent. Terence will be one of the most skilled boxers I’ve fought but he’s not that good that beating him would be the crowning moment of my career. Despite my two world titles and the size of this challenge the greatest achievement is still my Olympic silver medal. That changed my life and made me a household name around the world, overnight.